In the hope of continuing the System z upgrade boom that started last summer, Big Blue has rounded out its lineup with a midrange – what IBM calls "Business Class" – mainframe, the System zEnterprise 114. The machine is more or less what the rumors of two weeks ago hinted it would be – although it turns out there are two models, not one, and it's not called the z110 since it has 14 total engines in the box, including spares, not 10 as we expected. The new mini mainframe does have 10 user-accessible engines in the larger model, which is what we expected. Like other mainframes large and small (small being a relative term) for the past several years, the new zEnterprise 114 BC server has different microcode settings to allow the cores in its quad-core z11 processors to perform different functions. The Central Processors, or CPs, are the ones that can be loaded with IBM's z/OS, z/VM, or z/VSE operating systems to run COBOL and Java applications, DB2 databases, CICS transaction monitors, VSAM file systems, and so on. The engines in the frame can also be configured as Integrated Facility for Linux (IFL) engines for running Red Hat Enterprise Linux or SUSE Linux Enterprise Server, and can also be configured as Integrated Coupling Facilities (ICFs) for hooking multiple machines into a Parallel Sysplex cluster, System Assist Processors (SAPs) for running I/O, System z Application Assist Processors (zAAPs) for accelerating Java and XML workloads, and System z Integrated Information Processors (zIIPs) for goosing DB2 databases. The zIIPs and zAAPs take a z11 processor core and turn it into an offload engine, which IBM often calls a specialty engine to distinguish it from the normal CP engines. There are only two things that are special about these specialty engines: they are restricted to certain kinds of work and they cost a lot less than a standard mainframe engine and software stack for supporting Linux operating systems, Java and XML workloads, or DB2 databases. 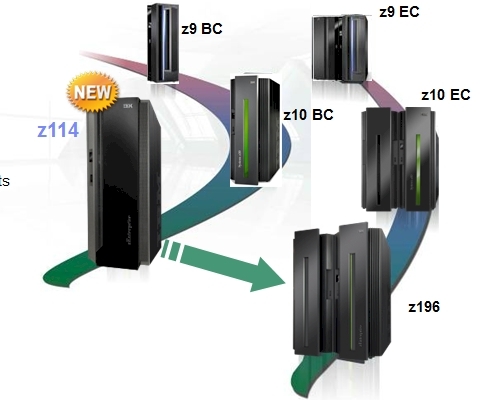 There are two different variants of the zEnterprise 114 BC mini mainframe being announced by IBM on Tuesday. The z114 BC M05 has a maximum of five z11 standard cores onto which end users can deploy IBM's operating systems, which can be configured as CPs, IFLs, or ICFs. the machine also has two engines configured as SAPs (for seven cores total in the chassis). Customers can deploy two of the five main engines as zIIPs or zAAPs. The z114 BC M05 comes with 8GB of user-addressable memory, plus 8GB that is taken for the hardware system area (HSA) for IBM systems software to use exclusively as a scratchpad for I/O configuration data. The system supports a maximum of 128GB, with 120GB being usable by operating systems and applications. Like the high-end System zEnterprise 196 machine launched last July, the z114 BC machines have a data protection scheme called Redundant Array of Independent Memory, which is similar in concept to the RAID data protection used on disk arrays, but only applied to main memory. The zEnterprise machines are the first IBM machines to offer this feature, and it could very well be in Power7+ or Power8 machines as well as future Xeon servers at some point in the near term. The z114 BC M10 doubles up the physical cores inside the box to 14, allowing for more IFLs, ICFs, zIIPs, and zAAPs, as well as allowing for two hot spare cores that can be deployed in an emergency. The M10 machine can have only five CPs, however, so for standard mainframe workloads running on z/OS, z/VM, or z/VSE, there is no point in buying an M10 over an M05. But if you want a Linux-only mainframe, then the M10 can host Linux on ten engines. The M10 has up to 256GB of real memory, with 248GB of it accessible to operating systems and applications. Both the z114 M05 and M10 machines support up to 240 ESCON or 128 FICON peripheral channels and from two to eight Crypto Express3 cryptographic coprocessors. The M05 can have a maximum of 56 external coupling links, while the M10 offers up to 72. The zEnterprise 114 BC boxes can also be deployed as the heart of a "system of systems" that includes BladeCenter enclosures and Power7 and Xeon blade servers all acting under the orchestration of the mainframe-based Unified Resource Manager, a protected network that is not exposed to the outside world. This hybrid mainframe-blade setup, called the System z BladeCenter Extension, or zBX for short, has been available since last fall using Power7-based PS701 blade servers, which themselves were launched in April 2010. Starting today, the zBX will also be available with IBM's HX5 blade servers , which launched in April 2010 with Intel's "Nehalem-EX" Xeon 7500 processors, and which now sport the latest "Westmere-EX" Xeon E7 processors. It's interesting that IBM is not supporting the HS22 Xeon 5600 blade servers inside the zBX setup. In any event, IBM is supporting the HX5-7873 blade, which is a two-socket server with 16 Xeon cores, on both the z196 and z114 mainframes. The zBX setup treats the PR/SM resource manager and hypervisor on mainframe engines, the PowerVM hypervisor on Power Systems blades, and the RHEV (KVM) hypervisor on Xeon blades as firmware all under the control of the Unified Resource Manager code that runs on the mainframe and accesses these hypervisors through an internal Gigabit Ethernet network. The Power blades can run AIX 5,3, 6.1, or 7.1 and the Xeon blades are able to support the latest Linuxes from Red Hat and SUSE, and will eventually be able to support Microsoft's Windows Server 2008. The zBX allows for four chassis of BladeCenters (across two racks) with a total of 112 single-wide blade servers to be linked to the mainframe and managed by the URM software on the mainframe.